The city is situated roughly in the center of Ehime Prefecture on the Matsuyama Plain. The geographical coordinates of our city hall are 132 degrees 46 minutes east and 33 degrees 50 minutes north. We are 7 longitudes west of Tokyo and dawn and dusk are both 28 minutes later. The city stands on a river basin formed by the Ishite and Shigenobu rivers， which flow between the Takanawa Mountains to the northeast and the Ishizuchi Mountains to the southeast. The area's geographic median tectonic line runs east west along the southern boundary of the city. There are fissures in the granite along the median line from which flows the hot waters of Dogo Onsen Hot Springs. The area is blessed with the temperate Seto Island Sea climate with an average annual temperature of 16.1°C. The average annual precipitation is 1,300mm, a low figure on the whole. Snowfall is negligible and typhoons don't nearly pass through here as often as in Kochi Prefecture on the Pacific Ocean side of the island. 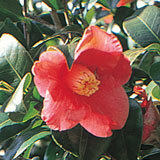 Camellias have been planted by the thousands in fields and temple precincts all over Matsuyama for centuries. They are a part of our historical and cultural heritage and rooted deeply in the lives of our citizens. Matsuyama-born artist Shimomura Izan conceived a design that harmonized pine trees (matsu) with mountains (yama) and called it "Matsuyama".